"A non-league ground for a non-league team"
How the bloody hell did this ground get League status? Especially when you consider that considerably better grounds have been rejected in the past? That was my opinion before I'd even gone to this ground, so you can imagine my delight when they got promoted to League 2, after we had just had our 4th consecutive Playoff defeat. After a relatively easy journey that surprisingly didn't take that long (about 2 hours 30 to be precise), we arrived in the town of Accrington and using the word "rustic" to describe it would be an understatement. Fortunately it is easy to park around the ground, and it's easy to see just how small the stadium is. Around the ground there is very little to do also, meaning that all you can do is wait. To show how non-league the ground is, on our first visit there were no doors on the turnstiles and on the second visit there were patio doors. Once inside the ground, you find it hard to believe that this was ever given League status. 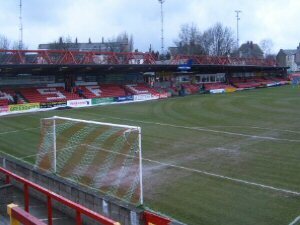 Infact, it reminded me a lot of Kidderminster's Aggborough before they redeveloped their main stand. 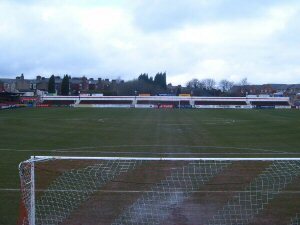 The difference being Aggborough and this ground is that I like Aggborough, at least that had an atmosphere to it. 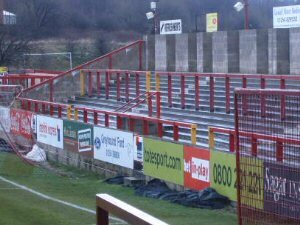 To the left was one of the most pointless main stands I've seen, it couldn't have housed more than 1200, it was absolutely tiny, but the stand opposite just appeared to be a roof over a path, no terraced steps at all. The two stands behind the goals appeared to be identical terracing. Thankfully the away end gave a decent view of the action. I would describe the atmosphere at The FES if it indeed had one. It was quite possibly the quietest stadium I've been to. 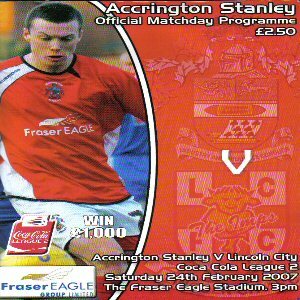 Not once did I hear the Accrington fans chanting, and this just completed a day at a ground that wouldn't have looked out of place in Lincoln United's division. 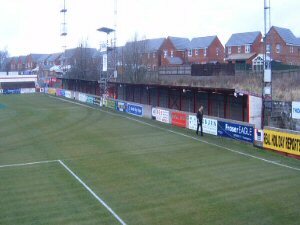 Unibond ground, Unibond town, Unibond fans, the only thing worthy of being in the League was the programme, well worth the £2.50 and one of the best in League 2. It is highly unlikely that I'd ever come to this ground for a game other than to watch Lincoln play. It was just horrible and I wouldn't cry if I never had to come here again. As you can guess, I didn't enjoy my day at Accrington, but it's safe enough as most of the fans are friendly, and you're unlikely to encounter any problems.